Pi Sigma Alpha, The National Political Science Honor Society, is the only honor society for college and university students of government in the United States. There are close to 700 campuses nationwide that have PSA chapters. It started in 1920 at the University of Texas with a purpose "to stimulate scholarship and intelligent interest in political science." The society functions at the national level, sponsoring programs and events of value to the profession and teaching of political science, and at the chapter level. 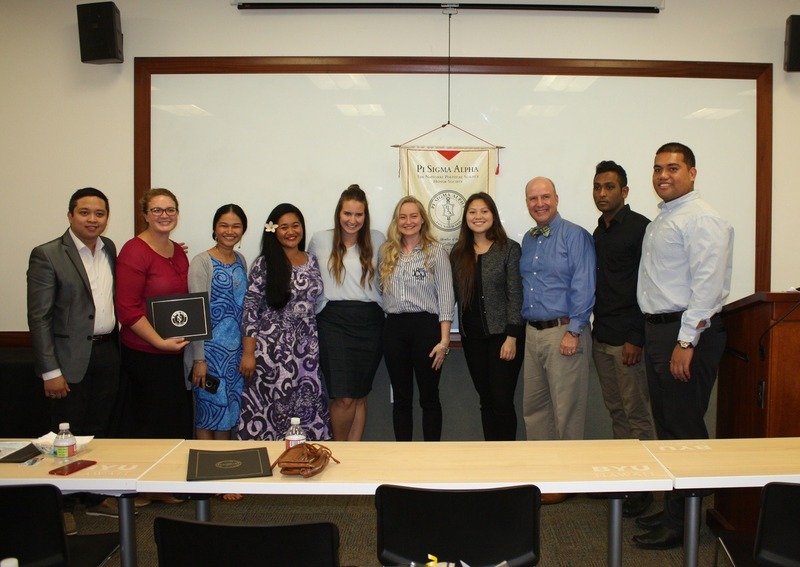 Brigham Young University- Hawaii has had an active PSA chapter for several years. Professor Rand Blimes is the representative faculty member who is in charge of the group here on campus. He has been actively involved in this role since coming to campus in 2009. His leadership and enthusiasm has been a great asset to the students as he has helped organize and expand PSA's reach among Political Science majors. As a PSA group, we meet several times a semester to talk about current events, political philosophy, to network with other students, and get to know our faculty members better. Some of our past meetings have included a get to know you session with Dr. Murdock, a skype session with Dr. Smith as he has been away on sabbatical, and organizing the various student leadership positions within our group. As a PSA chapter here at BYU-Hawaii we hope to develop stronger relationships among the student body and faculty within the Political Science Department. PSA is a great way to make friends, network, and meet people with similar interests as you. We look forward to expanding our current membership from a dozen students this year to many more as word spreads about our mission and purpose. PSA has helped me strengthen current friendships and create new ones as well as help me feel more involved in my major outside the classroom. I have used it to network and get to know my professors better as well as gain a better understanding of what various classes within our major have to offer. Going to the meetings has always been something I have looked forward to as there are always lively conversations about current events, politics, and useful information about things going on around campus. I would recommend anybody to join our chapter here on campus and help develop an even stronger bond with your fellow classmates. PSA is a great way to get involved and expand your educational pursuits.